While I was in Milan last month, I made some time to go view an exhibition at the Triennale di Milano. It is a contemporary art museum located in Parco Sempione very close to the Cadorna train station. The show was titled ” The New Vocabulary of Italian Fashion”. I just recently returned from my bi-yearly buying trip to Milan. I stay in what I like to think is a non-Milan neighborhood called the Navigli. When most people think of Milan, they think of chic shopping on Via Monte Napoleone, gazing the glass tiles of the Galleria Vittorio Emanuele II or touring the majestic and iconic Duomo. Don’t get me wrong, I like to do these things too. But I am most at home in the Navigli district. And though it’s mostly known for its late night activities. I like to experience it in the late afternoons and early evenings before the crowds of twenty-somethings take over the neighborhood bars. Being a small business owner myself, I like to support small local businesses, whether I am Seattle or in another city. 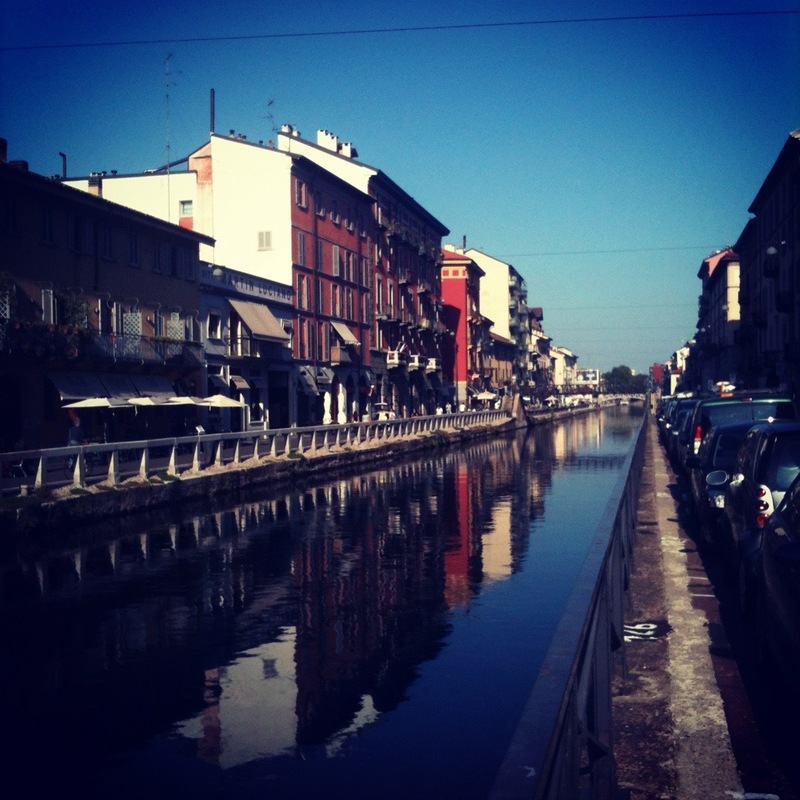 The Navigli is a neighborhood of hard working small establishments that are offering independent goods and experiences. 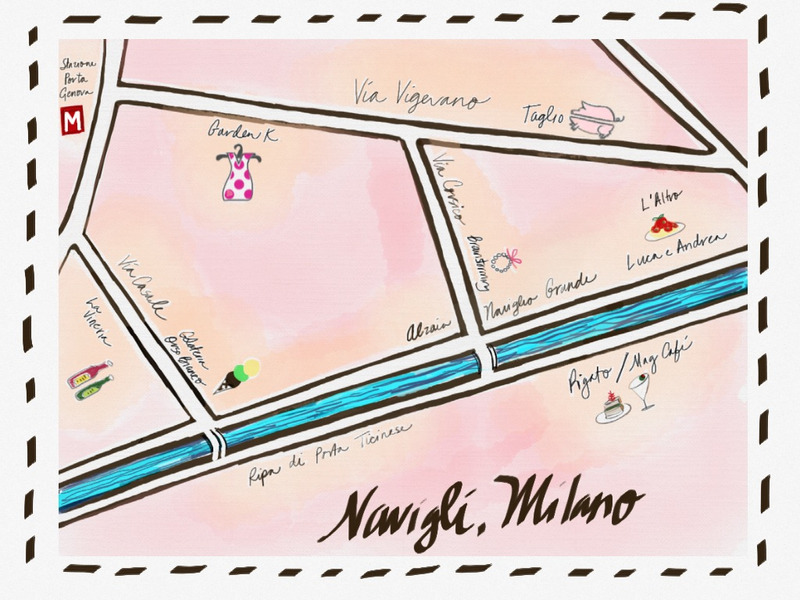 Here is a very small guide on what to see, drink and eat while visiting this burrow of Milan.The easiest way to get there is to take Milan’s “Metropolitana” subway. Take the green line towards Abbiategrasso/Assago and get off at Porta Genova. 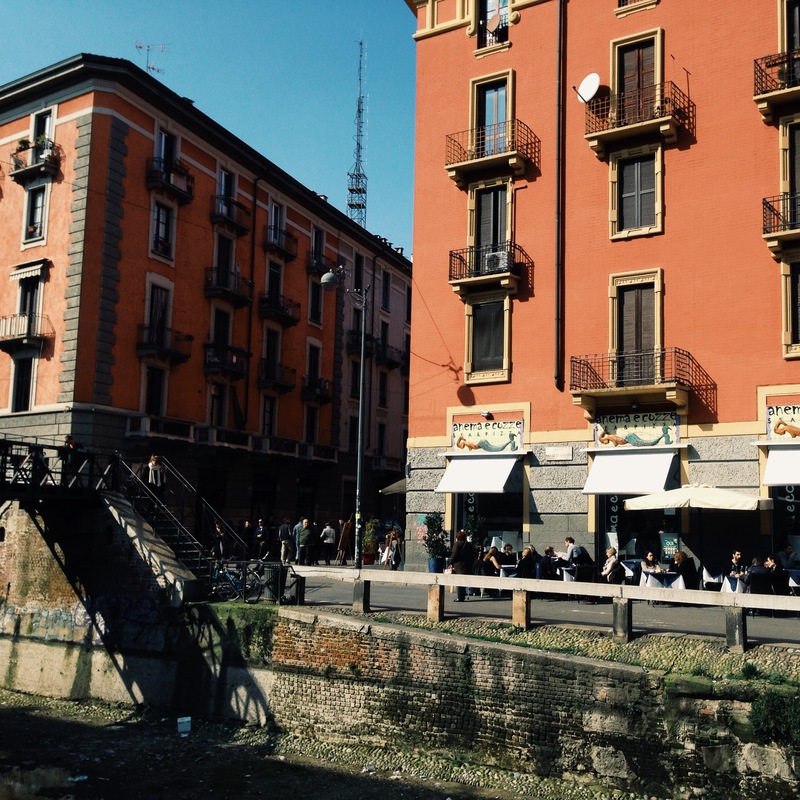 Start off your visit with a late lunch or an afternoon coffee at one of the many cafes along the Naviglio Grande. I particularly like to have lunch at L’Altro Luca e Andrea. A small cafe with delicious homemade pasta. Weather permitting, sit outside where you can watch the locals sipping their espressos or taking afternoon strolls. 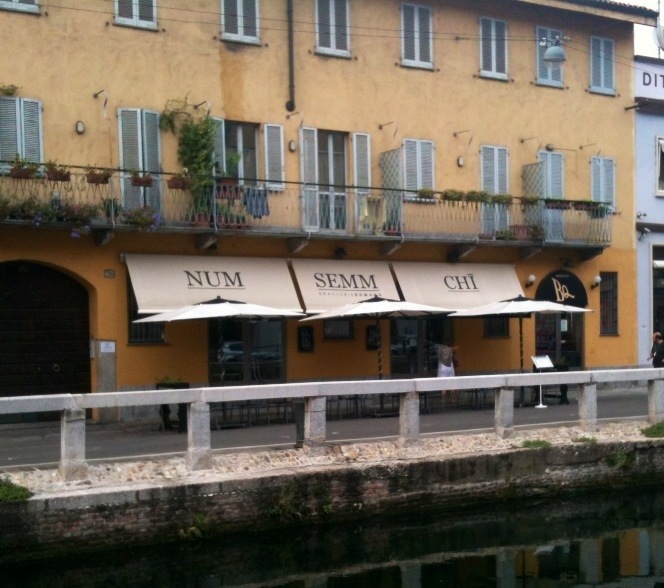 When you finish lunch, walk along the Naviglio Grande. Ripa di Porta Ticinese and Alzaia Naviglio Grande are the two main roads in the Navigli. Pop into the bookstores, vintage furniture and clothing shops that flank both sides of the canal. If you happen to be there during the flea market, you have hit the jackpot! Both sides of the canal are filled with over 400 vendors selling their antique and vintage collections. A must see occurrence that happens every last Sunday of the month. The adjoining streets to the Naviglio Grande have some fun little independent designer shops and boutiques too. Along Via Corsico, a new discovery for me was a small little gallery shop called Brandstorming. This little shop features local artists who use found objects and recycled materials to create unique jewelry and gifts. If you have room in your suitcase, check out and do not miss La Vineria on Via Casale. A wine distillery that makes and bottles there own wine blends. They also bottle olive oil which is my favorite thing to bring home. No room in your suitcases? You can still buy a bottle of wine and drink it in front of the shop. Feel like having a little treat? The Gelateria Orso Bianco up and across the street has wonderful organic frozen treats. 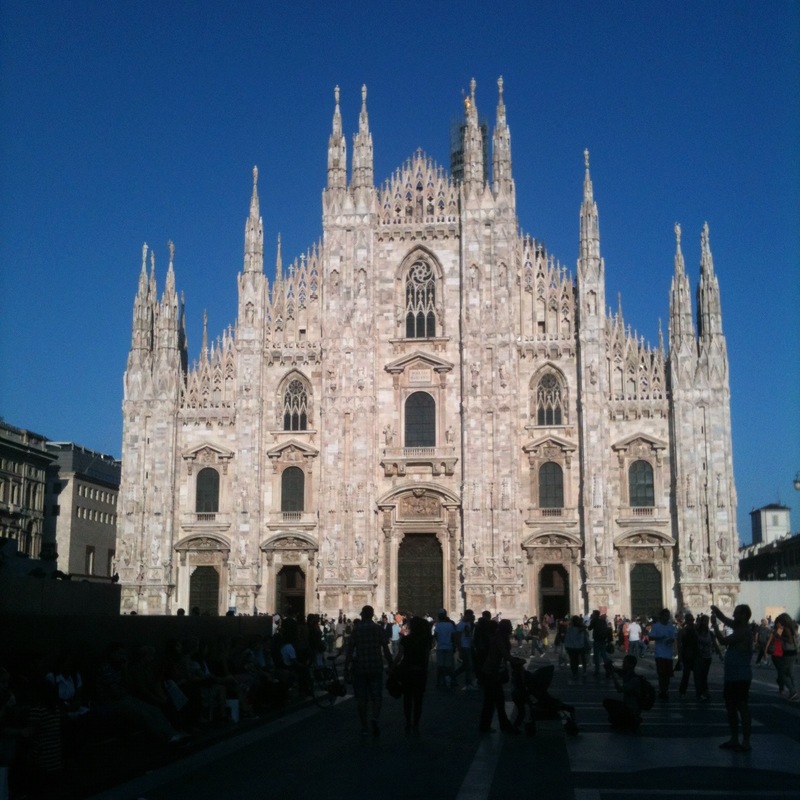 This Monday I am musing about my recent trip to Milan. I stay in an area called the Navigli at a little B&B that I have been fortunate to call home when in the city. I attend a trade show to buy shoes for our shop. I know, rough life. First a brief history of this charming neighborhood. The Navigli (meaning “fleet”, most likely derived from the Latinnavigium, which means “to navigate”) was a canal system originally built for irrigation and to transport goods into the city. In fact the marble used to build the Duomo in the 14th century was transported along the canal system from Candoglia (near the Swiss border) to the city center. Leonardo di Vinci engineered the first lock system using these canals at the end of the 15th century. 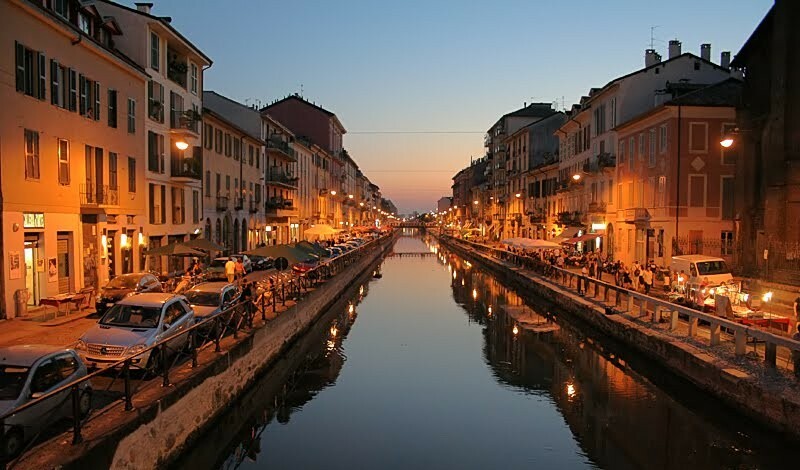 Though today, most of this canal system ceases to exist, the Navigli neighborhood has remained intact and is a romantic area to stroll, shop and eat. Artists’ studios, small shops, romantic bars, flea markets, and summer concerts make it a unique contrast to the rest of the city’s larger scale architecture. I was lucky enough to be there for the last Sunday of the month to witness the antique flea market. It’s a flea market that changes its venues every month, going to different neighborhoods in Milan. Imagine my surprise to walk out in the morning to find the street filled with vendors! These are snapshots I took with my Iphone on my way to and from work during my stay. 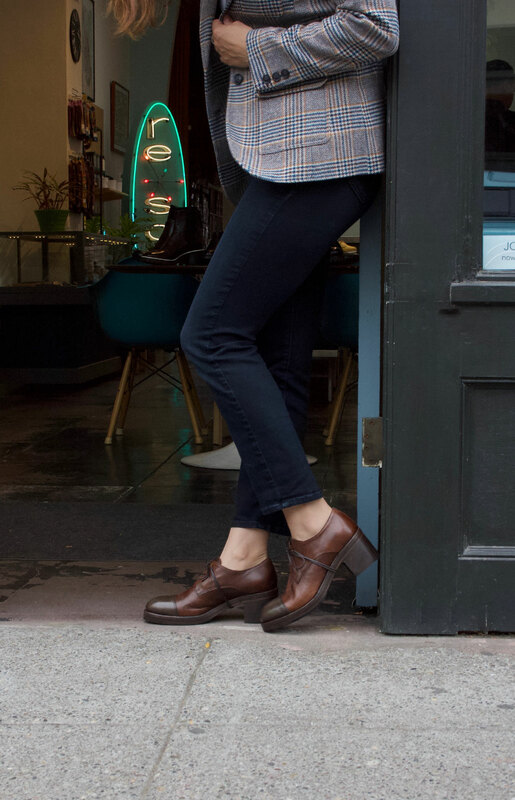 This Monday’s Mondays, Maggie Muses has been interrupted by a short trip to a distance country to bring our re-souL customers the latest and greatest in fashion footwear for fall/winter 2013. 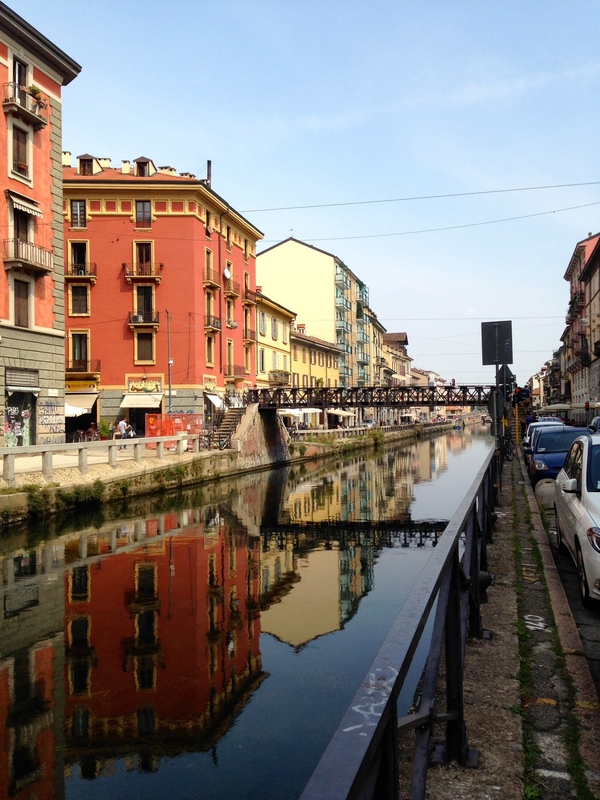 In the meantime, I will leave you with this pretty picture of the Naviglio Grande. See you next Monday! Every six months we are fortunate to come to Milan for a footwear trade show called MICAM. It is one of the largest shoe fairs around and people from all over the world come to attend. I have been coming to this show more times than I can count, but I still get excited to see what our vendors have in store for us for the upcoming season. This is a journal of my last trip. I arrive in Milan in the morning and lucky for me, the B&B that I stay at, has my room ready. I am able to take a nap! ( I hardly slept at all on the 14 hours of plane flights. ) Mid-morning turns to late afternoon when I had awaken from my nap. I shower, change and head out to the streets to take in the store windows. I wander down along the Navigli, up to Corso di Porta Ticinese and walk further up Via Torino until I end up at the Duomo. That evening I meet my italian friend Cristina for a drink. We stayed close to the Duomo as she had dinner plans of her own. It was lovely to see her and it was good to catch up. I later headed back to Navigli for an early dinner. I was still tired and wanted to be close to my little B&B. As I walked home, I was intrigued by a restaurant called “NSC”. It had outdoor seating and decorated quite modern with white walls, a crystal chandelier, reclaimed wood tables and french cafe chairs. It looked like it was packed with locals, so I gave it a try. I was not disappointed at all. It was delicious! 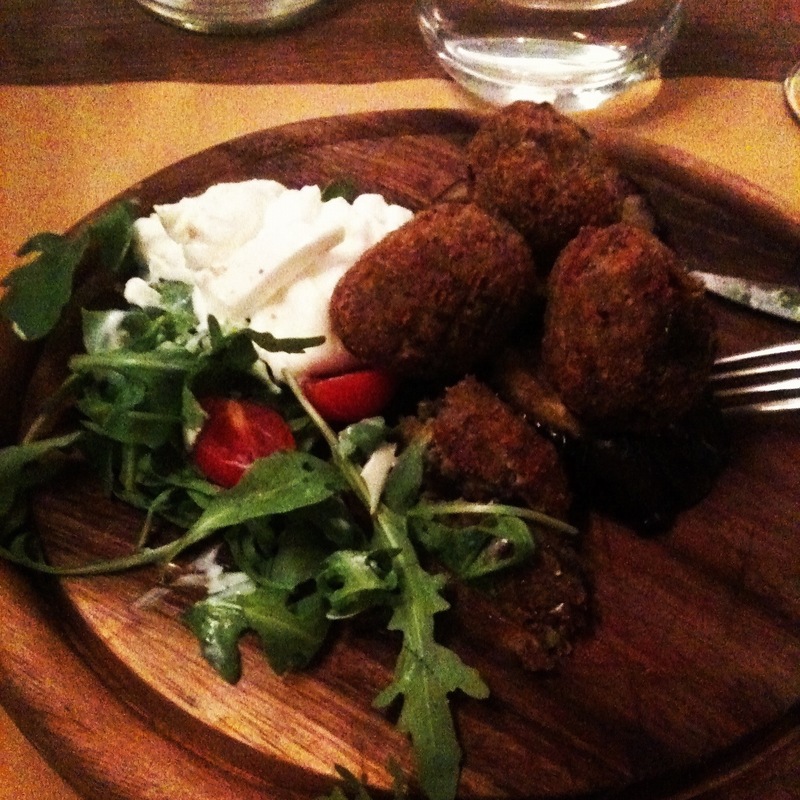 The buratta and polpettone made of eggplant was scrumptious. Feeling fat and sleepy I decide to turn it in for the night and save my energy for the next day. I knew I had a long day of walking ahead of me.